All Ryerson instructors and staff are required to use two-factor authentication in order to access Library eResources, eHR, RAMSS, and D2L Brightspace as of August 1, 2018.
e.g. Download Google Authenticator for iOS or Google Authenticator for Android. (i) Log in to my.ryerson with your username and password. (ii) Look for the Self Service module and click Personal Account. (iii) Under the Security section, click Two-Factor Authentication. If you don’t have a mobile phone or prefer not to use your phone, you can use a universal second factor (U2F) security key or a one-time verification (OTV) code generator. Check with your department for approval purchasing a U2F or OTV. 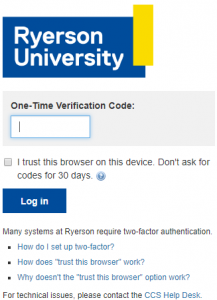 Two-factor is the best way to protect your Ryerson account and the information in it. With two-factor enabled, even if someone guesses or steals your password, they won’t be able to access your account without something only you would have, such as your phone. It will also protect your account from attackers in cases such as payroll diversions, identity theft, theft of intellectual property, and exam data. Please visit the CCS website for more about two-factor authentication at Ryerson. You can also contact CCS Help Desk at help@ryerson.ca or 416-979-5000, ext. 6806. This entry was posted in Eresources, News by Winnie. Bookmark the permalink.